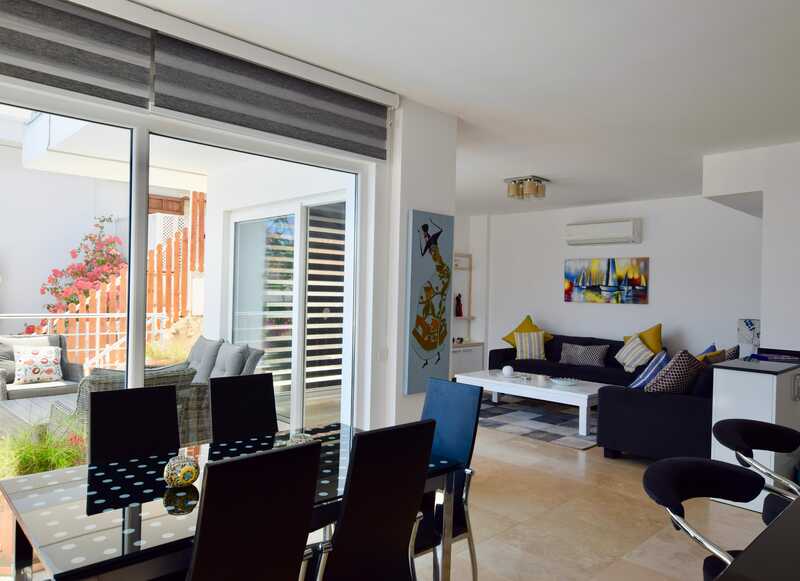 A modern, contemporary 5 bedroomed villa, in a great location with spectacular sea views, being only a 10 minute walk from the Old Town and harbour. 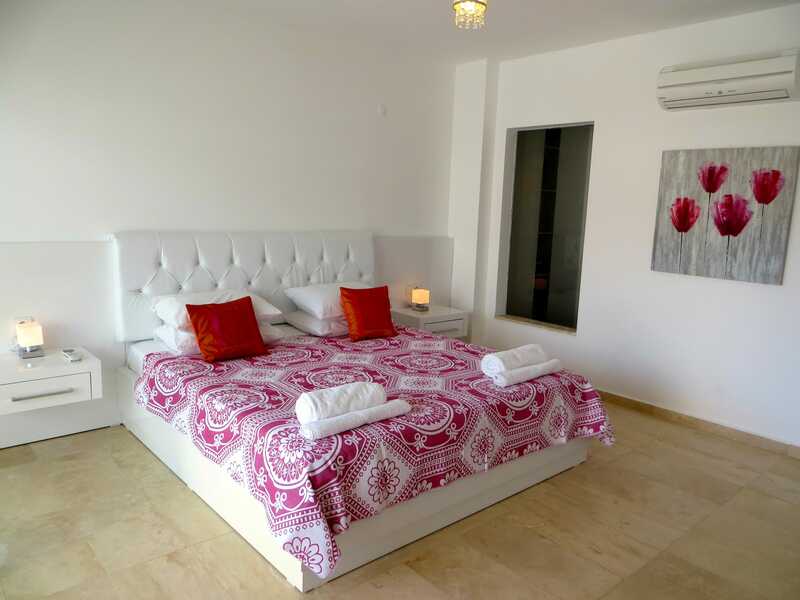 This spacious villa, set over 4 floors, is perfect for large families, or two families, or a group of friends to holiday together. The villa has a charming garden at the front and off road parking for one car. 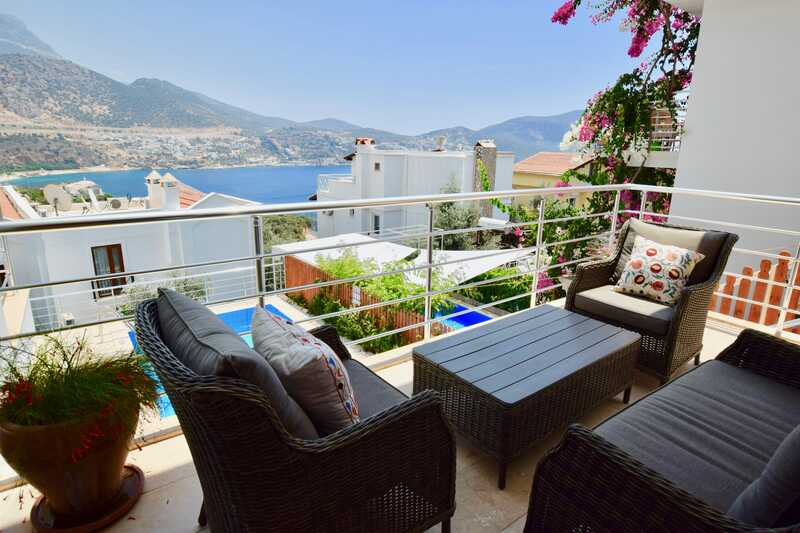 The location of this villa is perfect for getting to the Old Town and the harbour, with an easy (and relatively flat) 10 minute walk to all that Kalkan has to offer. 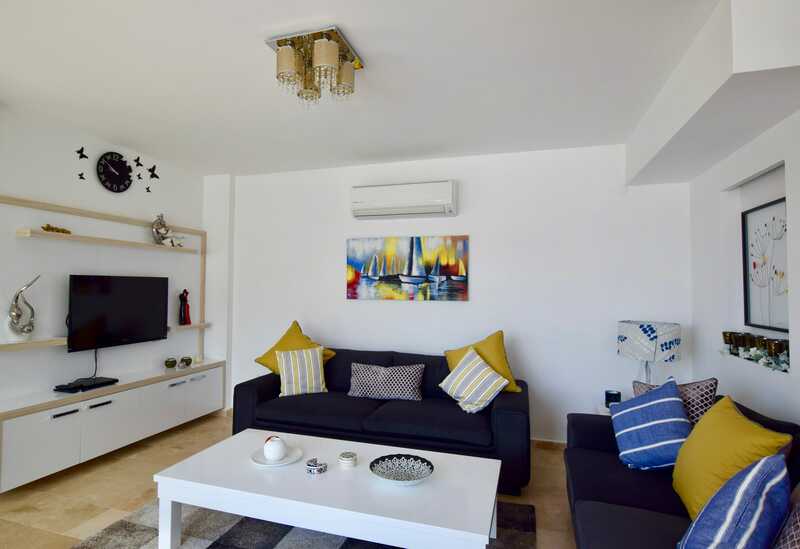 The ground floor level has an open plan modern kitchen with extensive units, a breakfast bar and dining table with seating for 6 guests, there are patio doors which open onto a balcony with bean bags, a perfect chilling area with great sea views. 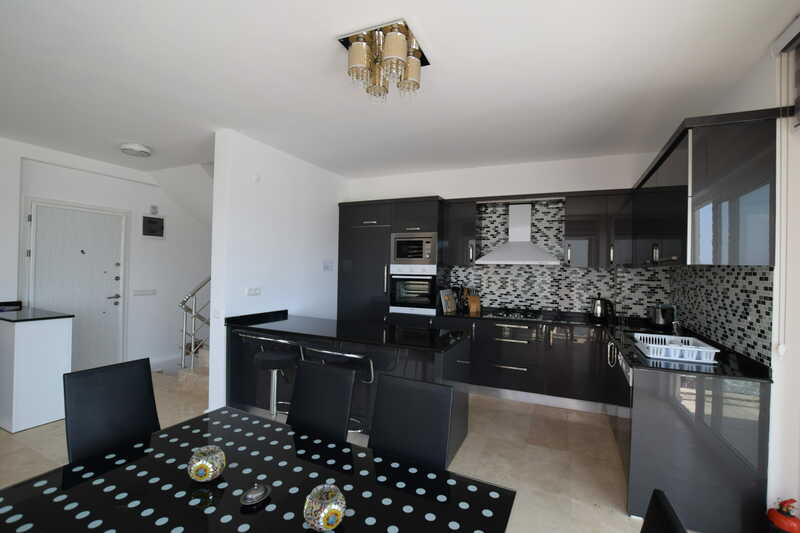 The kitchen has all the conveniences you would expect; oven, hob, extractor fan, microwave, fridge/freezer, dishwasher, kettle, toaster and electric Turkish ҫay maker. The open plan lounge area has comfortable seating with a wall mounted flat screen TV, CD/DVD player and iPod player. There are sliding doors from the lounge area which take you out on to a large balcony area, which has comfortable rattan furniture from which to relax and enjoy the views at any time of the day or evening. 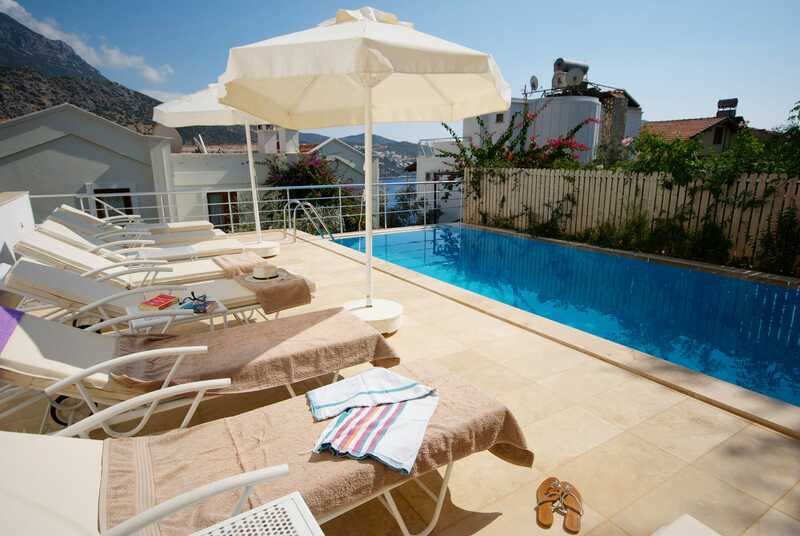 There are outside steps leading down from this balcony to the pool and terrace area. 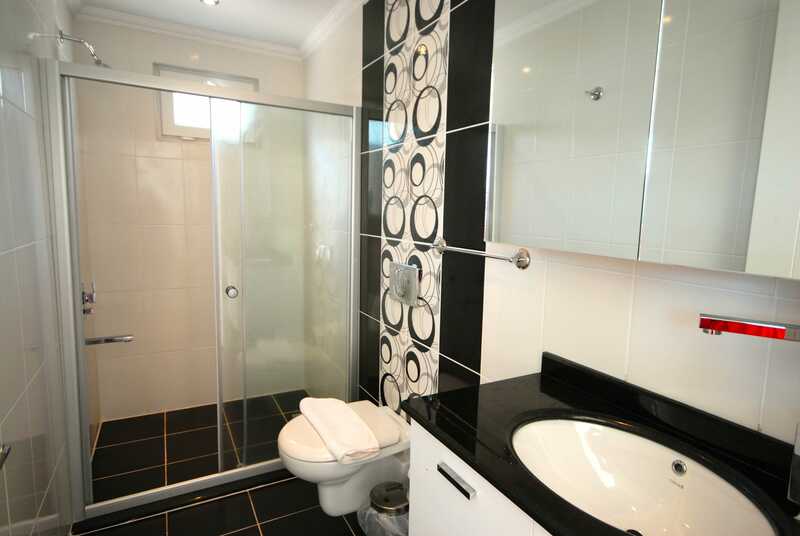 The lower floor that has 3 bedrooms all of which are ensuite. Bedroom 1 (master) has a king size bed and an ensuite walk-in shower bathroom. 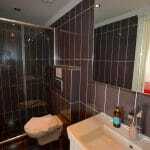 Bedroom 2 has a double bed with an en-suite walk-in shower bathroom. 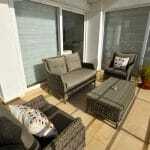 Both bedrooms have patio doors which open onto the pool and the terrace. 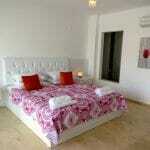 Bedroom 3 is accessed from the pool terrace and has a double bed with ensuite walk-in shower bathroom. 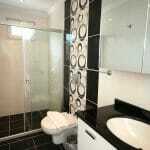 On the first floor there are 2 bedrooms, both ensuite. 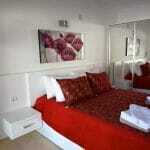 Bedroom 4 has a king sized bed and an ensuite walk-in shower bathroom. 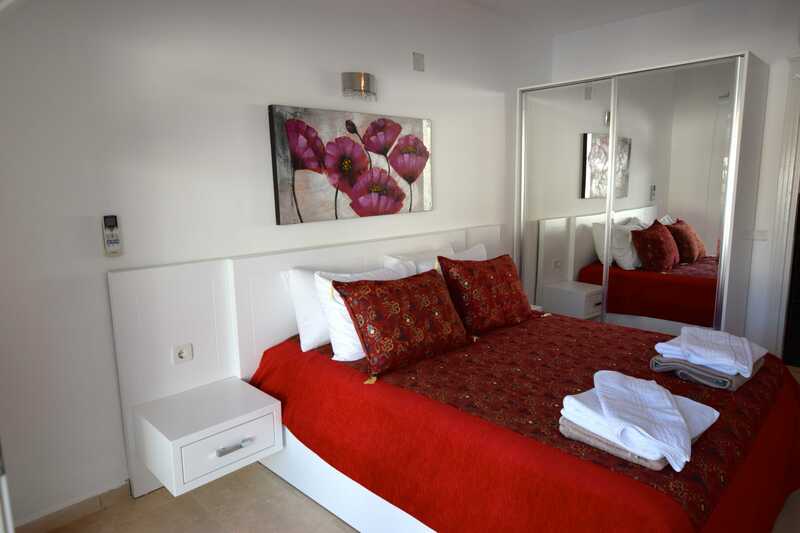 Bedroom 5 has twin single beds with an ensuite walk-in shower bathroom. 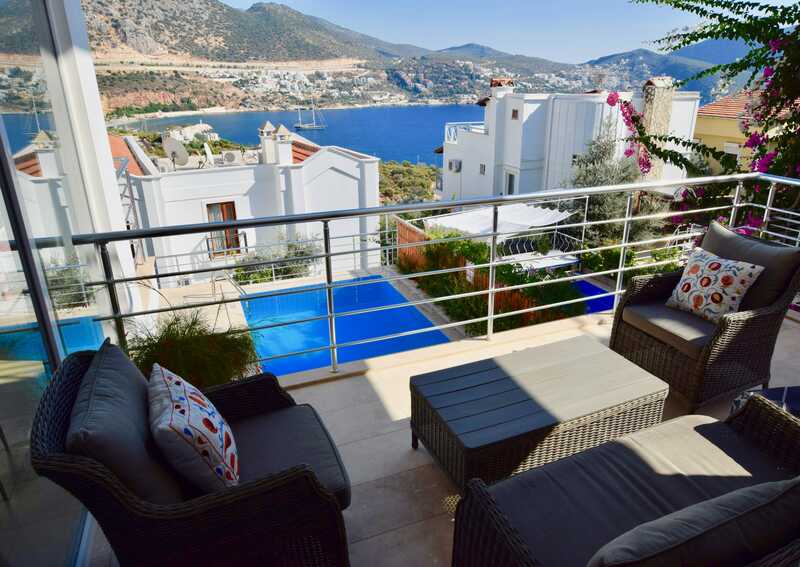 Both these bedrooms have patio doors leading onto balconies, with a table and two chairs on each from which you can enjoy uninterrupted sea views of Kalkan Bay and the harbour. 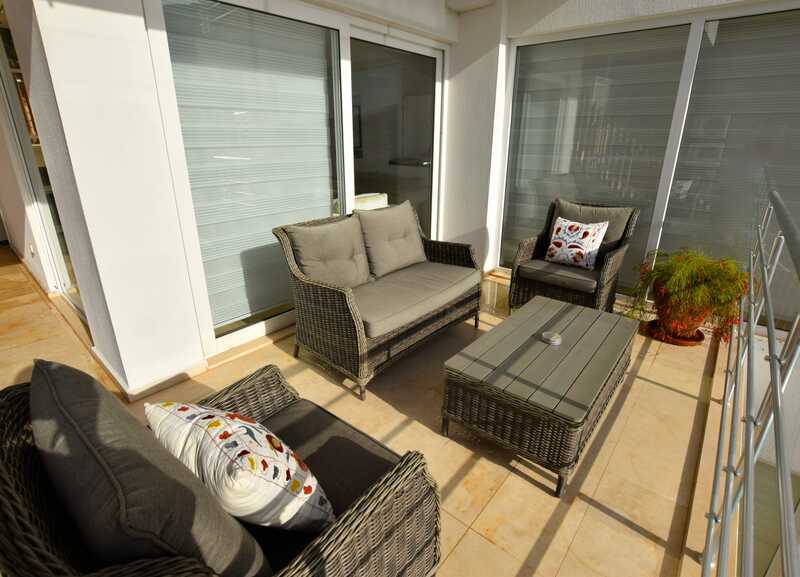 On the top level there is a large spacious roof terrace that has comfortable seating and a parasol. 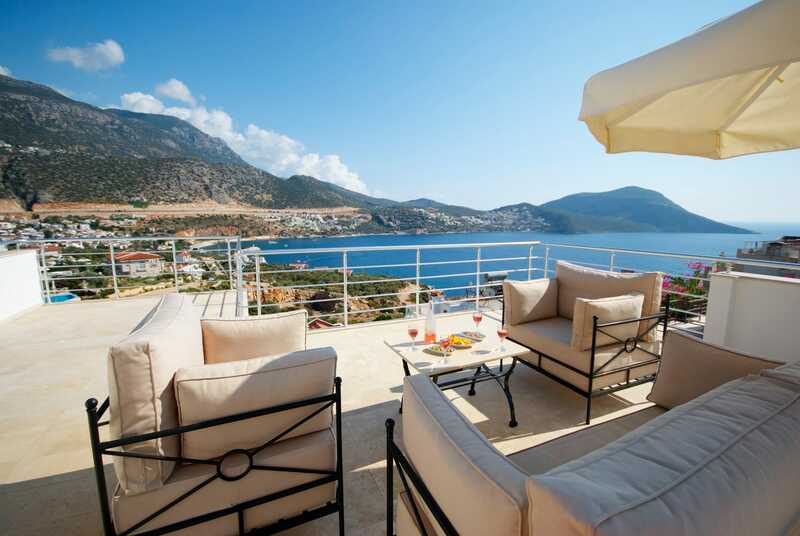 This is the perfect spot to enjoy a sundowner whilst you take in the panoramic sea views of Kalkan and the Bay. Over the 2018/19 winter, adding a pergola and plunge/spa pool on the roof terrace (new pictures to follow). 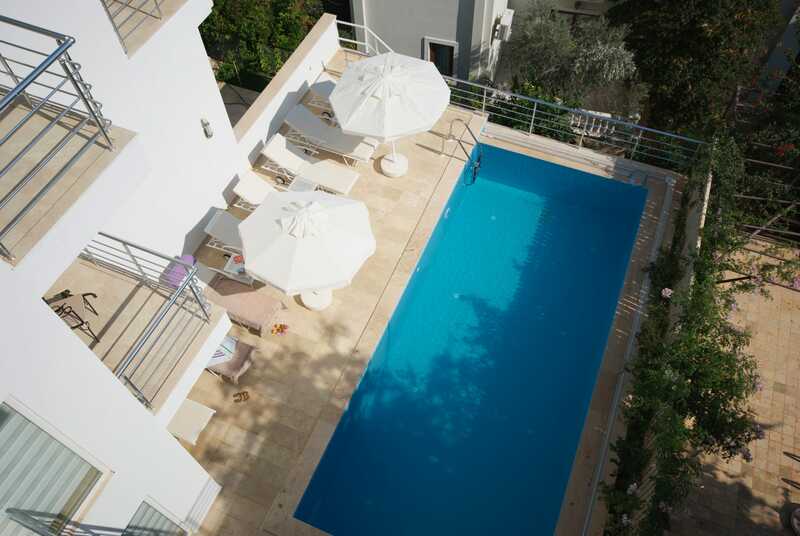 Outside, by the private pool, there is a spacious sun terrace with sun loungers and parasols together with a dining table and seating for 10 guests. 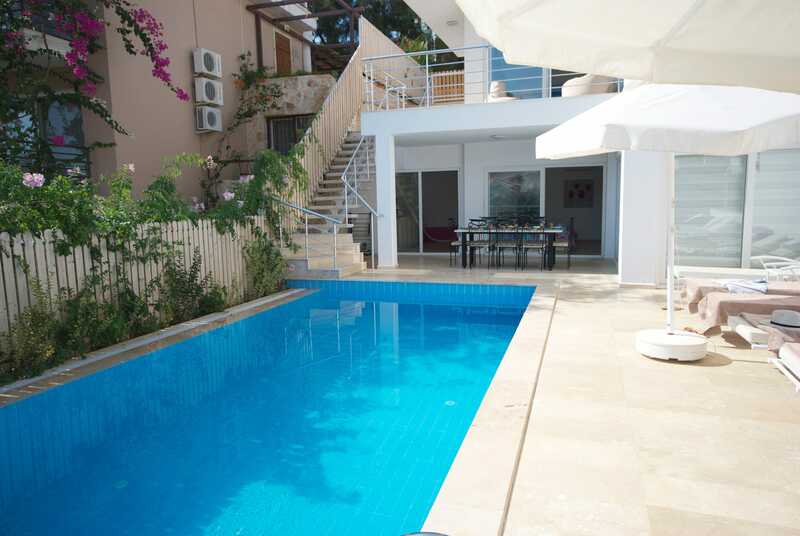 There is an outside kitchen with a fridge, for keeping your wine and Efes chilled by the pool! There is also a BBQ. The pool is a constant depth of 1.7 metres. 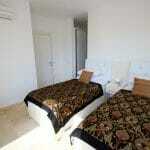 All of the bedrooms have fitted wardrobes and hairdryers and all rooms have air conditioning. 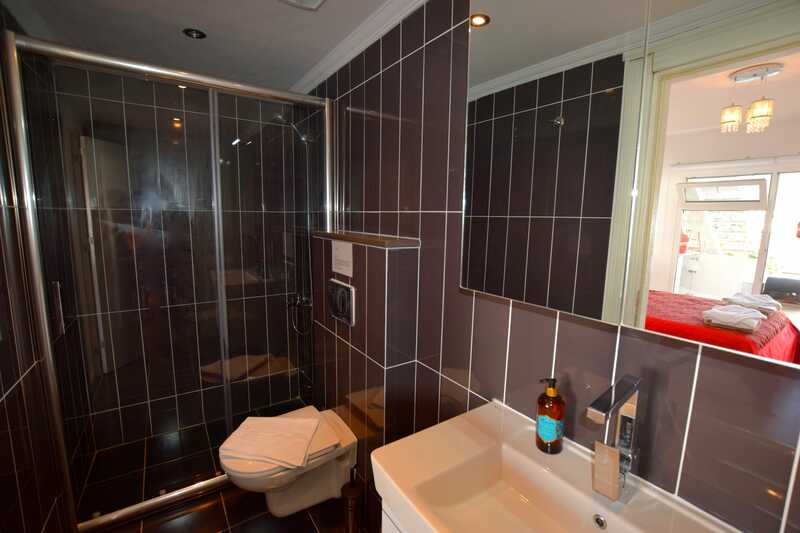 On the lower level there is a washing machine, iron and ironing board. 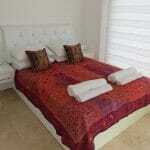 The villa has wifi and two safe deposit boxes. 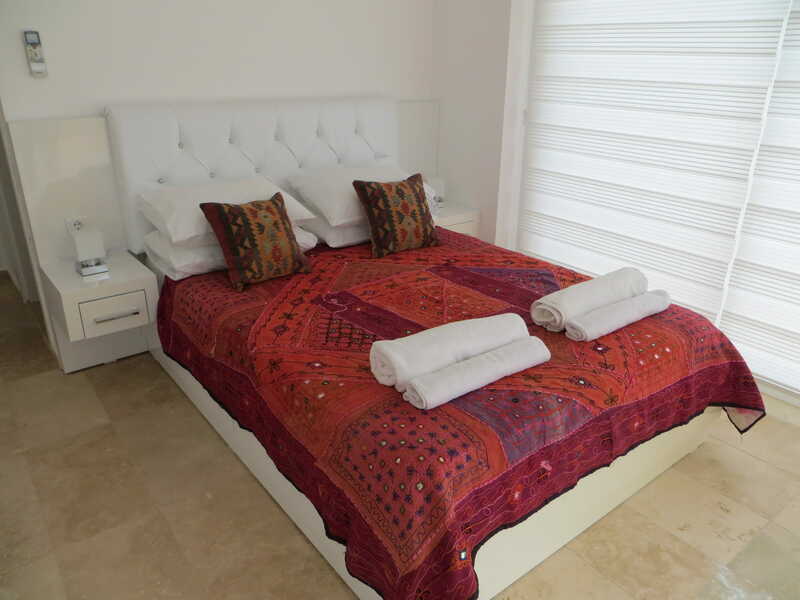 Guests staying with Truffle at Villa Emily will be provided with Truffle’s signature products: Cotton sheets, towels (including beach towels), Truffle bath robes and complimentary Truffle slippers. Also a Welcome Hamper consisting of tea, coffee, sugar, fruit juice, milk, bottled water, bread, eggs, butter and jam. This is the villa to stay at. 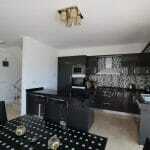 Location is brilliant with a gentle 10 minute walk to the old town harbour area. Loads of really good restaurants and comfortable bars, cafes etc to just drink, chat and watch the world go by! A very laid back part of the world. 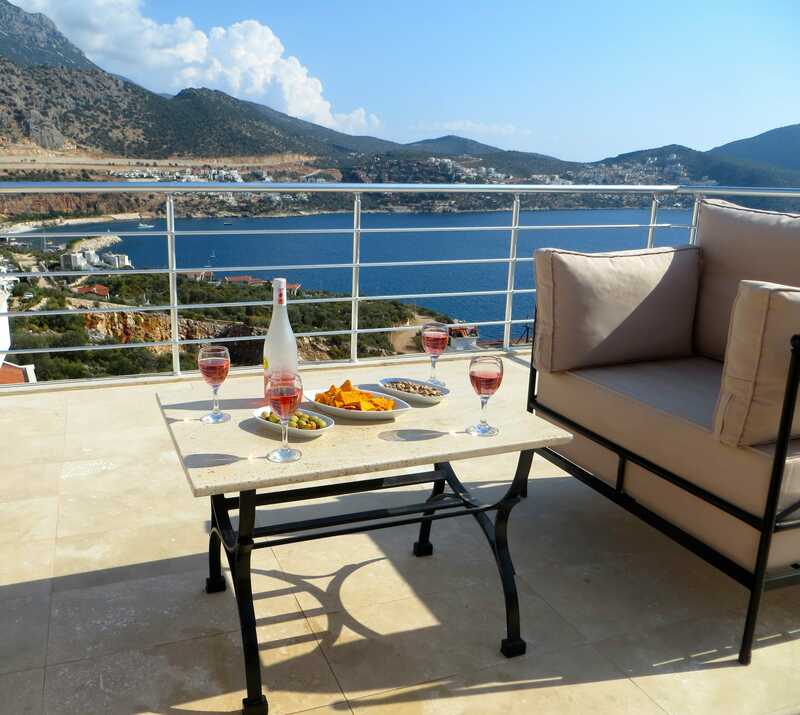 Villa Emily is just perfect and the views are to die for. Highly recommend an evening in with a glass of wine and just watch the sun go down from the roof terrace. 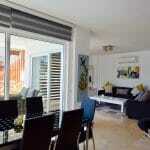 Well furnished and decorated to a high standard with air conditioning and private pool. All the amenities you need are just around the corner within easy reach, 5-10 minute walk. Try out the BBQ evening at the close by regency hotel (dancing waiters to add comical quality to the evening), great steaks at the harbour front Doy Doy restaurant or lunch at salt and pepper terrace restaurant. Aubergine is a fabulous fish restaurant on the harbour front. A boat trip along the coast is a must. Just for the sheer pleasure of wasting a whole day being lazy, drinking the odd glass of wine and eating some quality fresh food. Do not miss out on a full Turkish bath. Do this early into your holiday to get you ready for relaxing and recuperating! 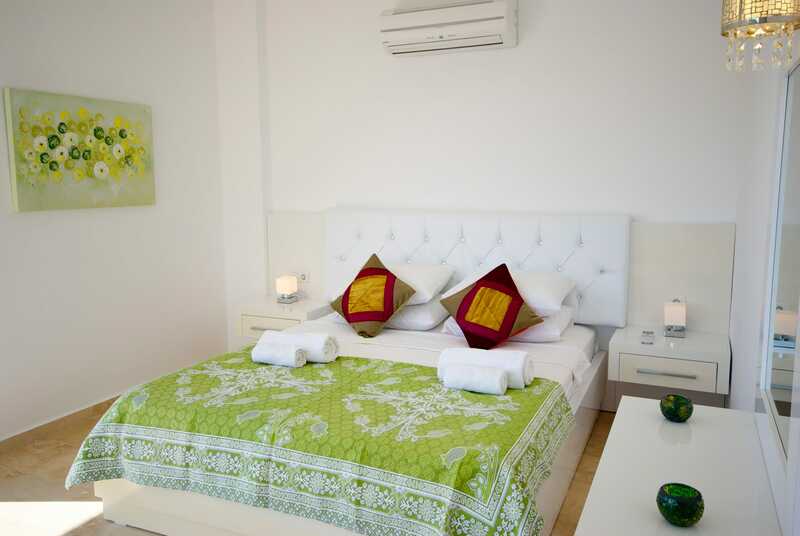 This is a classy villa, in a classy resort for the discerning traveller. Enjoy!